It’s a week of big number ones, with the continuing saga of the B.P.R.D. post-Hellboy and the beginning of a new time period in the Star Wars universe. B.P.R.D. 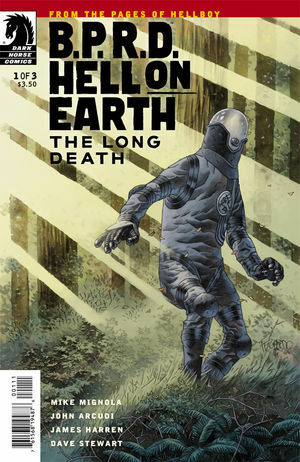 : The Long Death #1 begins a new adventure for Johann Krauss (in his brand-new, action-figure-ready suit) and the rest of the B.P.R.D., investigating some scary monsters in a cold climate. It’s a fun jumping-on point with a deeper horror vibe than some of the previous stories. 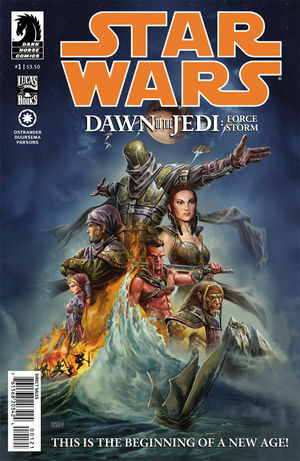 Star Wars: Dawn of the Jedi #1 has a lot of world-building to do and does it with a lot of text narration. I think this could have been handled a little more smoothly, but the world set up is interesting with a conflict (and cool villains) I’m interested to see more of. Those are the two releases this week from Dark Horse, but they’re biggies. Make sure to check them out at your local comic shop or at Dark Horse Digital. Thanks to Aub Driver and the fine folks at Dark Horse Comics! Let us know what comic books you’re looking forward to in the comments below! This entry was posted in Currently Geeking and tagged bprd, comics, dark horse, dark horse comics, hellboy, jedi, star wars. Bookmark the permalink.